WIME returns after a short hiatus with a special double edition featuring two weeks’ of news that include significant and not-so-secret bilateral agreements, nuclear developments and aspirations, an array of United Nations appearances and more bloodshed in Gaza. On Tuesday, March 20th, President Donald Trump welcomed the Crown Prince of Saudi Arabia, Mohammed bin Salman, to the White House. The Qatar blockade, the war in Yemen, the Iranian nuclear deal and American arms exports were among the top agenda items for the two leaders. The visit marked the start of the crown prince’s two-week tour across America aimed at finding foreign investors, identifying business opportunities and building a more positive image of the kingdom among the American public. The effort is part of Saudi Vision 2030, the economic plan initiated by the crown prince to diversify the Saudi economy and modernize Saudi society. Saudi Arabia has spent millions of dollars in efforts to reshape its public image, and in particular, to encourage continued cooperation between the two countries. Donald Trump has expressed his support of the partnership with the U.S.’s oldest ally in the region as well as his eagerness to benefit from the Kingdoms’ enormous wealth through its arms purchases from the United States. 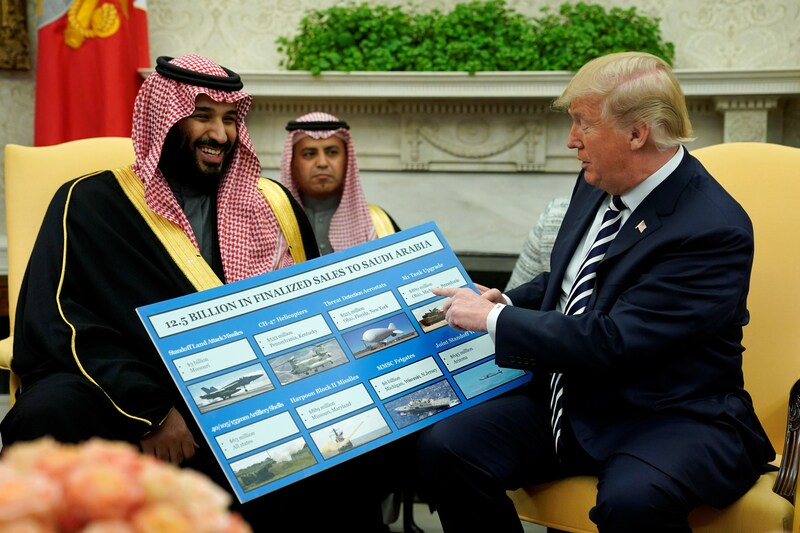 With MBS by his side, Trump enumerated the financial rewards reaped by the United States — through the boost to the American economy and the creation of new jobs — as a result of the alliance, using a cardboard chart during a public Oval Office press conference. In the exchange, the Saudi military gains world-class military hardware and a boost in morale provided by a strong relationship with a global power, both elements that are critical in its ongoing battle for regional supremacy with neighboring Iran. This strategic relationship has endured despite occasional spats. On Thursday, the Trump Administration announced its approval of a $1 billion arms sale to Saudi Arabia. This came after a failed attempt by the Senate to challenge the executive branch’s war powers. 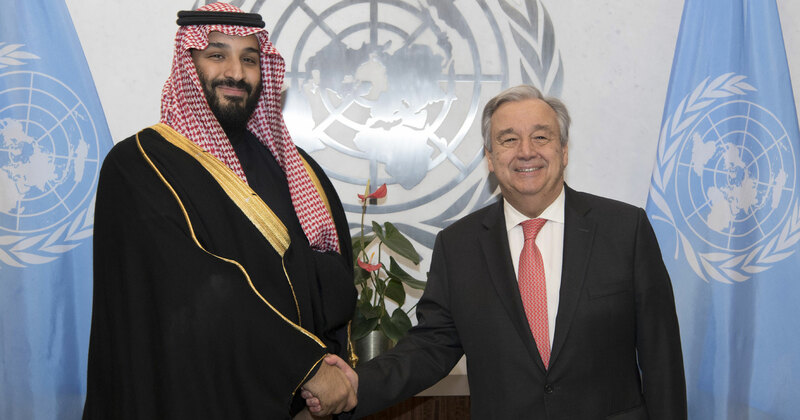 A defeated resolution would have prohibited support of the Saudi-led coalition in Yemen which some policymakers have alleged has led to a humanitarian crisis and killed thousands of civilians. The Senate voted 55-44 on Tuesday against taking up the war powers resolution, which had been opposed by the Trump administration. The subject of nuclear energy and its use is never far from the headlines but there were some particularly interesting stories this week. On Tuesday, Israel admitted to the bombing of a suspected Syrian nuclear reactor in 2007 as an alleged warning to Iran to avoid further development of its own nuclear weapons, while on Saturday, UAE’s energy minister, Suhail Al-Mazrouei, welcomed South Korean President, Moon Jae-in, to celebrate the construction of the first nuclear power plant in the Arab world. The UAE has made an enormous investment of $18.6 billion dollars to the Korea Electric Power Corporation (KEPCO) to build the nuclear facility in Abu Dhabi. The first of four reactors was completed last year and is set to start operations in May. This is a milestone in the country’s efforts to diversify its economy, move away from the heavy dependence of fossil fuels, develop alternative sources of energy and create more jobs. In line with increasing energy demands resulting from growing economies and populations, Saudi Arabia, Turkey and Jordan have also announced nuclear power projects. With more Middle Eastern nations possessing nuclear powers, the risk of nuclear arms increases and the question remains if this will contribute to a more stable or unstable region. On the 23rd, Saudi Arabia and Israel took a step in breaking down their public diplomatic tension by permitting a Israel-bound plane to fly over Saudi Arabia for the first time in 70 years. Officially, Saudi Arabia still doesn’t recognize the state of Israel but their mutual distrust of a common enemy — Iran — has resulted in an “open-secret” of frequent cooperation and communication between the two American allies behind closed doors. Thus, the flight was a rare open indication of the strengthening of the relationship between the two nations who officially have no diplomatic ties. Qatar, the subject of an ongoing blockage by several other Arab states, is still banned from entering Saudi airspace. The shifts in alliances coincide with sectarian rifts, changes in leadership across the region, and the need for new global partnerships in response to an inconsistent and confusing U.S. foreign policy. On March 27th, the UN received nearly $1 billion from Saudi Arabia and the UAE for humanitarian aid in Yemen. According to the UN Secretary General, this will cover almost one-third of the funds needed to implement the 2018 Yemen Humanitarian Response Plan. That same day, UNICEF (the UN children’s branch) reported that almost half a million Yemeni children have dropped out of school since 2015. Many parents have chosen not to send their children to school due to the danger and high risks of being on the roads. In total, around two million children lack access to education in Yemen. With an increasing number of children being recruited to fight in the conflict, the country faces long-term economic disadvantages associated with an uneducated generation in addition to the more immediate challenges of disease and lack of medical care, infrastructural damage and food shortages. On Friday, March 30th, Israeli troops opened live ammunition on Palestinian protesters along the Gaza border with Israel, killing 18. The rallies marked the observation of Land Day and were the beginning of a planned, six-week-long Great March of Return, advertised as a peaceful protest commemorating the roughly 700,000 people who either fled or were expelled from their homes in the war surrounding Israel’s creation in 1948. Land Day is an annual event at which Palestinians remember the killing of six unarmed Arab protesters in Israel in 1976. As many as 30,000 arrived early in the day at tent encampments on Gaza’s side of the fence, while Israeli forces deployed more than 100 snipers along its side in support of regular IDF soldiers. 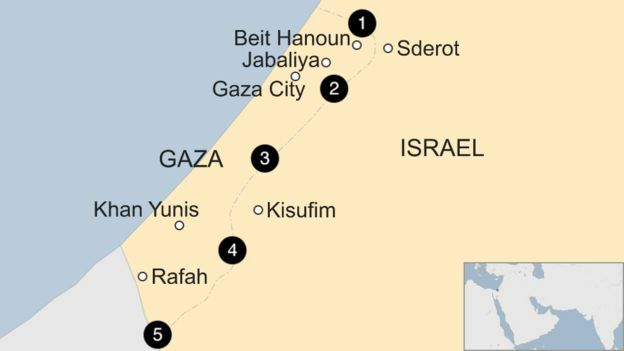 According to the BBC, “Although most protesters stayed in the encampments, some groups of youths ignored organizers’ calls to stay away from the fence and headed closer to Israeli positions. The IDF said troops were “firing towards the main instigators” to break up rioting that included petrol bombs and stones being thrown at the fence.” With over 1,500 protesters injured, hospitals in Gaza struggled to treat patients due to lack of medicine and supplies. This was the single deadliest day in the Israel-Palestine conflict since the Gaza war in 2014. Many international leaders condemned Israel’s use of deadly forces, including UN Secretary-General Antonio Guterres who called for an independent investigation into the violence. Israeli Prime Minister Benjamin Netanyahu praised the Israeli army for “guarding the country’s borders” from Hamas. Brig Gen Ronen Manelis, the Israeli army’s chief spokesman, denied allegations that excessive force was used and claimed that Gaza health officials had exaggerated the number of wounded.